Technological Excellence, Mechanical Efficiency, Operating Economies, Brevini Power Transmission industrial Expertise. These are the qualities of the new E Series: the ideal solution for industry in the third millennium. In fact this innovative series of planetary gear units, perfect for industrial applications with intermediate powers and torques, is the Brevini Power Transmission answer to the needs of globalized customers who require more performance in compact and limited spaces. The new E Series relaunches the concept of modularity, championed by Brevini for half a century, enhancing it with substantial technological innovations: overhung pins, reduction stages with four planetary gears, ground gears with optimized profile. 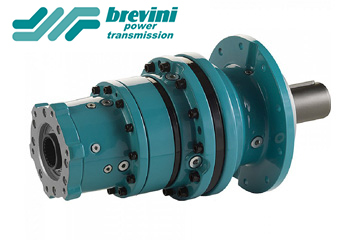 Brevini Power Transmission has designed the sizes (and subdivided reduction ratios) following a scalar and coherent mathematical logic, to provide the best solution for the various application needs of Customers. In detail, the E Series comprises 9 harmonically developed sizes, with torque from 1˙200 Nm to 26˙000 Nm. Available in in-line and right-angle execution, and up to 4 reduction stages (up to 6 stages on customer request). The reduction ratios cover a very wide range, from 1:3 to 1:3˙000 and over.